You can send Doug queries regarding your Hollingsworth ancestors by selecting the "Genealogy Queries" menu selection and completing the displayed contact form. Be sure to include your email address so Doug is able to respond to your query. The Hollingsworth surname can be found in written records for the past 800 years. According to the late Harry Hollingsworth, one of the family’s most prominent Cheshire Landscapegenealogists, the first written mention of our clan was of one Tomas de Holinewurth, of Cheshire, who signed the Burgh charter some time between 1211 and 1225. By 1298, the family begins to appear in the Lancashire records as well, when a land grant to Matthew de Hollinworth was recorded. And in 1339, Johannes de Holynworth and Rogerus de Holymworth are recorded in a poll tax in Yorkshire. By the early fifteenth century, the surname begins to appear in the records for Derbyshire and Nottinghamshire as well. Cheshire, Lancashire, Yorkshire, Derbyshire, and Nottinghamshire are adjacent counties in the north and northwest of England, and it is conceivable that all of these entries refer to descendants of a common ancestor. However, in 1487, John Holyngworth wrote his will in the southeastern English shire of Suffolk. It is possible that this John was also a descendant of the Cheshire family, but it is also quite possible that John represents an unrelated family who adopted the same surname. 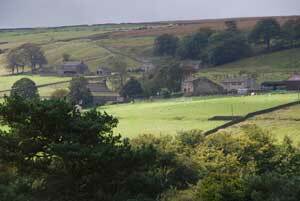 Lancashire CountrysideRecent DNA testing has added more confusion to our understanding of the origins of our family. We have tested the DNA of a proven descendant of the Hollingworth family of Hollingworth Hall, Mottram, Cheshire, and find that he matches very few other bearers of the surname. Those that are genetic matches have been found in Derbyshire and halfway across the globe in Australia. Most of the Hollingworths in England share a very different pattern of DNA, one that is also found in males with other surnames, such as FitzRandolph, Davenport, Roper, and Crook. Additional research is needed to unravel this tangled genetic puzzle. Besides these families, there was another Hollingsworth family that was in Lincolnshire at least as early as the early 1600s. DNA testing shows that this family is not related to either the ones in the northwest of England or the southeast of that country. However, they are genetic kin to the Hollingsworth clan who settled in Cambridge in the middle of the seventeenth century. In addition, there was another Hollingsworth family who homesteaded in fens of Lincolnshire in the 1600s. Little is known of the origins of this branch of the family, who may or may not be an offshoot of one of the branches mentioned above. 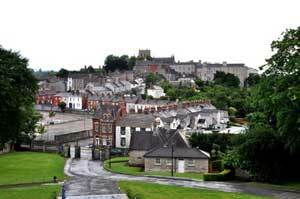 Armagh, Northern IrelandBesides the English families, there were at least 2 Irish families of Hollingsworths, both of whom first appear in the written records in the early 1600s. One family settled in County Armagh as part of the Ulster Plantation at least as early as 1632. The Hollingsworths who were in the counties of Wexford and Wicklow, in the southeast corner of Ireland, are genetic kin to the ones in County Armagh, but a documentary link between the two has not been established. There were Hollingsworths in County Down, which is adjacent to County Armagh, by 1700. These Hollingsworths may have been in Dublin as early as 1660. The fragmentary records that we have on this family indicate that they were more affluent than most of the rest of the family. I assume that both of these families have English roots, although there is no genetic or documentary records that link them to any known branch of the English family tree. 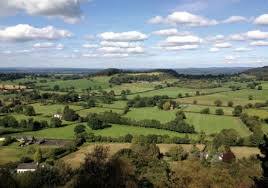 The County Armagh clan may have come from northeastern Yorkshire, as they intermarried with families from that area. I have found no documentation on the origins of the County Down family, and their DNA does not match any other Hollingsworths that we have tested. In an article published in 1965, the late Harry Hollingsworth concluded that the first American settlement of our family appears to be the family of Richard Hollingworth, who settled in Salem, Massachusetts in 1635. He was a shipwright who may have come from Norfolk in eastern England. Descendants of this family later lived in the area of Fairfield, Connecticut. Research by Betty Hollandsworth Jackson indicates that another part of the family may have settled in Maryland in the late 1600s. Other Hollingsworths soon arrived in the New World. John and Charles Hollingsworth were indentured servants who settled on the Eastern Shore of Maryland in the mid-1600s. Many of their descendants took to spelling their surname “Hollandsworth” about the time of the American Revolution. Valentine Hollingsworth, the progenitor of most of the American Hollingsworths, arrived from County Armagh, Ireland with his family in 1682. 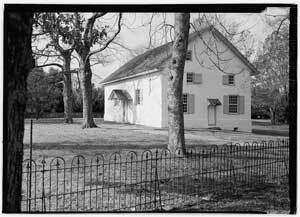 They were part of William Penn’s colony of Newark Union, site of Valentine Hollingsworth's Quaker Newark Meeting Quakers, and resided at Christiana Hundred, Delaware. George Hollingsworth is known to have been living in Baltimore County, Maryland, as early as 1695, and probably earlier. There are no proven Hollingsworth descendants of George, but it is likely that some of the members of our family who lived in North Carolina in the late 1700s were his descendants. Kennet Quaker Meetinghouse, successor to the Newark Meeting and a Hollingsworth Worship site for over 250 yearsThe Canadian Hollingsworths, for the most part, have Irish roots, with the family in Nova Scotia tied genetically and by historic record to the clan in County Down. Most of the Hollingsworths in Quebec and Ontario emigrated from County Wexford. Hollingsworths settled in Barbados, Australia, and New Zealand as well. Little is known of the origins of the cousins in Barbados, while the ones in Australia and New Zealand hail from a variety of vicinities in both England and Ireland.